I am a marathon runner. I now know this to be true. Even though I am three kilograms overweight and my mileage isn't what it used to be, I am a marathon runner. It's official. How do I know? Because I read it in Esquire. And then I read it in Harper's Bazaar. The former sells about 59,000 copies, the latter about 110,000 copies. Each of those copies is probably read by about three people on average. My last book sold 2-3,000 copies (I take consolation in the probability that some of the people who will read it are not yet born). So what these magazines say must be in some sense true, and therefore I am an author, English professor and marathon runner. Why do these magazines disclose this? Some months ago my dear friend Helen suggested I might want to be involved in a photoshoot. I confess to having been doubtful about the exercise. But in November I found myself in a London hotel being handed a dark blue Prada velvet suit. My civilian clothes were evidently not up to scratch. Also present were Sarah Storey, an extraordinary athlete who has about 16 paralympic medals over five games in two disciplines -- cycling and swimming (and no Wikipedia page?!? ); Roger Black, multiple olympic medalist and former 400 metre British world record holder; Cat and Georgie, both SUPERchicks (evidently -- the make-up artist spent much more time with them than with me); and Alex Vero, the documentary maker and would-be olympian, about whom you may have read in Runners' World. Needless to say my fifteen-minute discourse about packaged leverage, internet finance, market (de-) regulation and the inevitability of the present collapse wasn't the kind of thing Scottish Widows were looking for, so that didn't make it into the magazine. 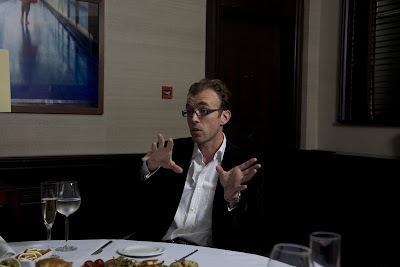 Nor the picture of me waving my hands about like I'm i) a prophet, ii) explaining my theory about Shakespeare, machiavelli, the Essex circle, and the difference between the two tetralogies. Nonetheless, the suit looks nice. Shame they didn't let me keep it. Now I just have to hope that none of my students reads Esquire or Bazaar. And, let's face it, I need to concentrate a bit more on my running.